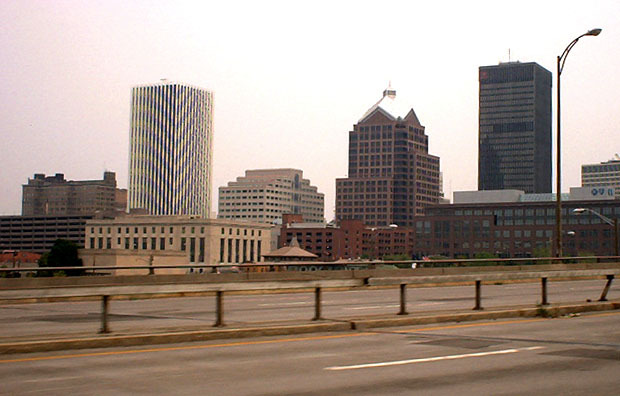 The Inner Loop is a circular freeway enclosing and delineating Rochester's downtown district. 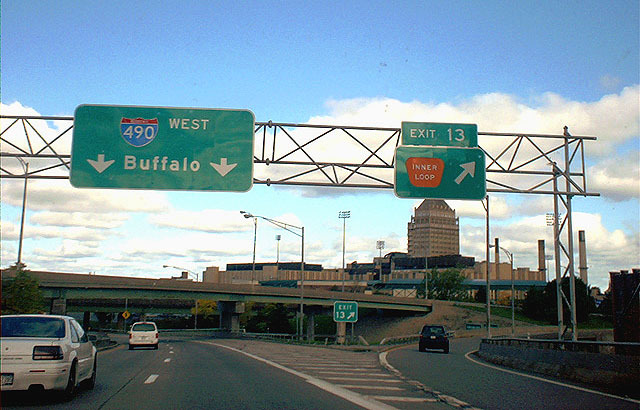 The southwestern third of the Inner Loop overlaps Interstate 490 between exits 13 and 15, while the remaining two-thirds constitute state reference route 940T. 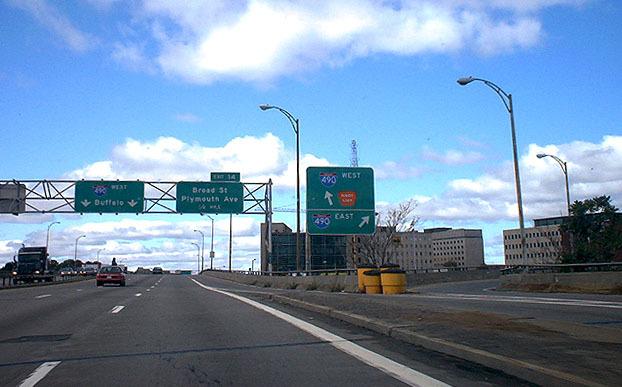 Beginning a counter-clockwise lap of the Inner Loop, we leave Interstate 490 at Exit 15, having just crossed the Troup-Howell Bridge over the Genesee River. The exit ramp splits, with the left fork curving sharply over I-490 to continue the Inner Loop. The right branch serves NY 15 and South Avenue, which are not the same road as the signage seems to imply: NY 15 runs southward on Mount Hope Avenue, west of South Avenue. 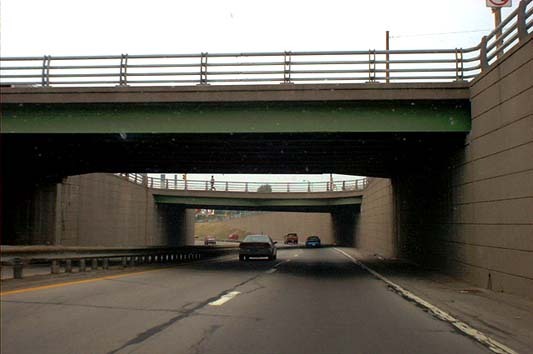 The overpass just ahead is one of two entrance ramps to I-490 eastbound from South Avenue and the clockwise Inner Loop. This whole interchange is fascinating for its complexity and small size. After leaving I-490, the Inner Loop descends into a trench between concrete retaining walls. Service roads made up of fragments of different streets run at surface level along the sides of the trench, and throughout the Loop. At one point the Inner Loop rises up for an interchange with the service roads: Pitkin Street on the inside and South Union Street on the outside. 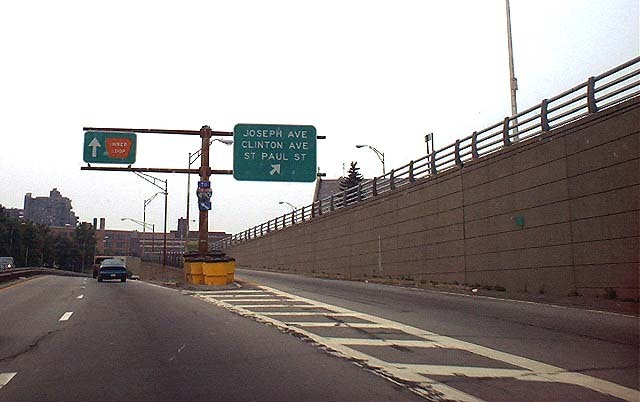 In the clockwise direction, shown here, this interchange serves as the exit for Monroe Avenue (NY 31) and Chestnut Street, unsigned. The presence of Clinton Avenue on this sign is somewhat misleading: only northbound Clinton Avenue (i.e., towards downtown) can be reached from this exit, and only by way of intervening surface streets. 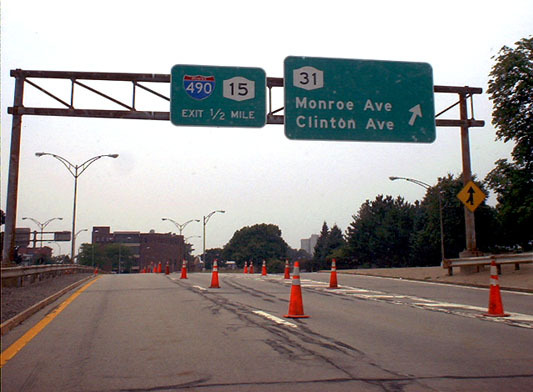 It is probably included here for the benefit of motorists who might be expecting an exit ramp for Clinton Avenue in the I-490/NY 15 interchange complex (see above), as there is from I-490 westbound. In fact, there is such a ramp from the Inner Loop, but it only serves Clinton Avenue southbound, away from downtown, and is something of a well-kept secret. 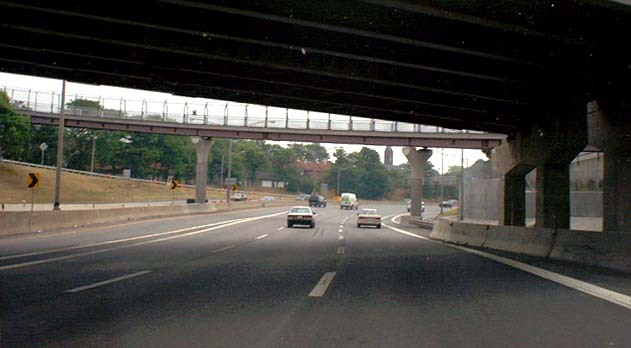 The entrance ramp at this interchange, not quite visible in the background, carries traffic from East Avenue and Broad Street. It is extremely short and has no acceleration lane at all; motorists would be well advised to heed the "Yield" sign posted there. The orange cones in the photo are due to a minor construction project that had the right lane closed on this particular day. North of East Avenue the trench opens up somewhat, the concrete walls giving way to grassed embankments. Beyond East Main Street, the inner roadway lies at a higher level than the outer. Facing counter-clockwise again, we see the shallow rock cut in which the outer roadway lies, and we see the exit ramp from the opposing roadway as it crosses over the outer lanes. In this picture taken on the inner roadway, we see the advance signage for the left exit to East Main Street and University Avenue. This is just west of the rock cut shown above (compare the church steeple visible in both photos). Here the outer roadway is beginning to rise back up to the level of the inner. The Scio Street exit ramp pictured meets that street at its intersection with Delevan Street, while the opposing entrance branches from Lyndhurst Street. These streets, although they parallel the Inner Loop on either side, are residential in nature and do not function as service roads. On the other hand, the East Avenue/Broad Street exit merges into Pitkin Street, which acts very much like a service road. To the west of Scio Street the highway again enters a trench, making a series of S-curves at the same time. The exit ramp shown here climbs the retaining wall to merge with Cumberland Street, the name of the service road on the north side. This exit serves all three streets named on the sign in sequence. The recently-installed sign gives the street names in capitals, a little-observed standard in New York State. A much older trailblazer for I-490 is mounted on the sign support. A short distance to the west, we are about to pass beneath first Joseph Avenue, then Clinton Avenue, which branch apart just inside of the Loop. Cumberland Street is now running along both sides of the roadway, high atop the retaining walls. The confined space, the tight curves, sudden grades and dangerous merge conditions all result in a 45 MPH speed limit on the Inner Loop. After crossing the Genesee River at the crest of High Falls, we are approaching the western junction with I-490 (at Exit 13) and the western terminus of reference route 940T. The Inner Loop shield on the sign shows the designation continuing around onto I-490 eastbound. Here the highway sits atop an elevated concrete structure alongside the CSX railroad mainline near Frontier Field and the Amtrak passenger station. We've just passed over State Street, and we see the road rising up over Plymouth Avenue just ahead. At this point the service roads are part of Allen Street. Westbound, the service road runs very tightly between the Inner Loop and the railroad, which also sits upon a concrete embankment. This is Exit 13 from I-490 westbound, the western terminus of reference route 940T. 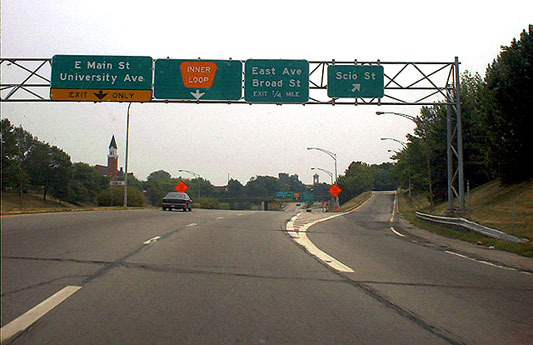 Signage in this direction indicates only the Inner Loop, while signs on I-490 eastbound give destinations of "downtown east" for the Inner Loop and "downtown west" for Plymouth Avenue. The latter is not an available exit in the westbound direction, but is reached instead by Exit 14. This interchange is a directional T, with the added feature of the CSX mainline overpass, visible here in the background. Beyond that is Frontier Field, Rochester's baseball and soccer stadium. Nearing the starting the point of our trip, we are met with a fine view of Rochester's skyline as the Inner Loop, now overlapping Interstate 490, crosses the Genesee River on the Troup-Howell Bridge. The three most prominent buildings are the Chase, Bausch & Lomb and Xerox towers (from left to right). In the foreground is the Rundel Building of the Rochester Public Library, to the right of which the cupola of the 1905 Lehigh Valley Railroad station is visible (this building is currently occupied by a restaurant). Behind the latter two is the Clinton Square office building, almost casino-like in its design. The Troup-Howell Bridge, named for surface streets near either end, is expected to be replaced by a more striking structure within the next several years. It spans not only the river but also Exchange Boulevard (NY 383) and a parking lot. The speed limit on the bridge, as on all of I-490 between exits 12 and 16, is a mere 40 MPH. Roughly the reverse of the above view, this photo shows the clockwise terminus of reference route 940T as it merges into I-490 westbound at the Troup-Howell Bridge. 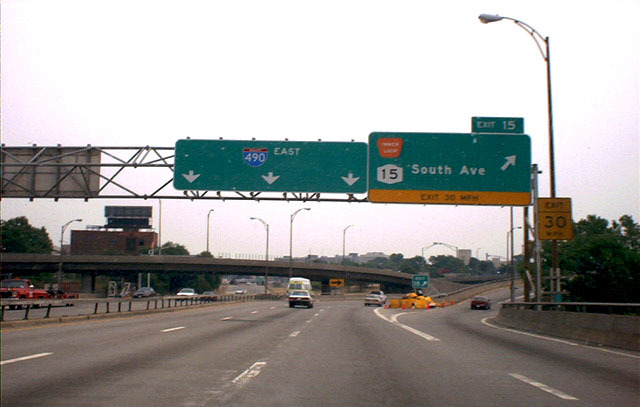 The ramp at right, which most maps show as being accessible from I-490 westbound, merges into the left lane of I-490 eastbound (see photo below). This loop ramp is mostly elevated above the Genesee River. Exit 14, visible on the sign bridge, connects to Broad Street via South Washington Street, and to South Plymouth Avenue via Spring Street. Leaving the Inner Loop, and continuing eastbound on I-490, we pass beneath Clinton Avenue and its connected new pedestrian bridge, The highway enters the old bed of Rochester's late subway, formerly the Erie Canal. The ramps entering on either side in this photograph are interesting in that they both originate from the same two points: the Inner Loop (clockwise) and South Avenue. 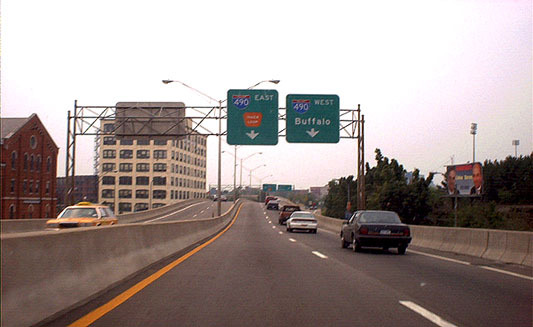 This is because the right-hand ramp was originally intended to serve the cancelled Genesee Expressway (I-390), which would have had its terminus here instead of at the edge of town. 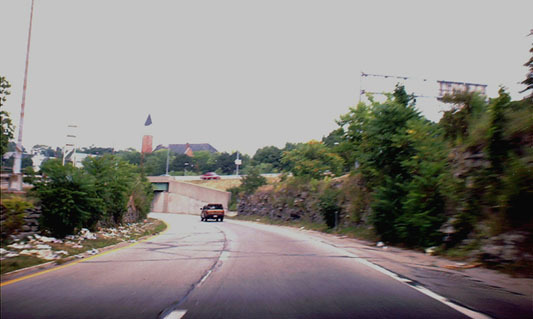 In the background is westbound Exit 16, which leads to Clinton Avenue.